Winifred Thompson, 100, of State Center, passed away on Monday, December 3rd, at Unitypoint Health in Marshalltown. Funeral services will be held at 11:00 a.m. Saturday, December 8th, at the First Presbyterian Church in State Center with Rev. Tom Bower officiating. She will be laid to rest in the Clemons Cemetery. Visitation will be held from 9:30 a.m. until service time at the church. In lieu of flowers, memorials may be directed to her family to be designated at a later date. For condolences, please visit www.mitchellfh.com. The Mitchell Family Funeral Home West Marshall Chapel is caring for Winifred and her family. Ph. 641-483-2900. Born on March 12th, 1918, at the family farm home near Melbourne, she was the daughter of William A. and Wilhelmina “Minnie” (Schneider) Wickersham. She graduated from the Van Cleve High School in 1935 and later attended the Iowa State Teacher’s College in Cedar Falls, graduating in 1939. On November 18th, 1939, she was united in marriage to Charles L. Thompson. They made their home on a farm northwest of State Center and were blessed with four children: Charles, JoAnn, Jeanne and Ronald. 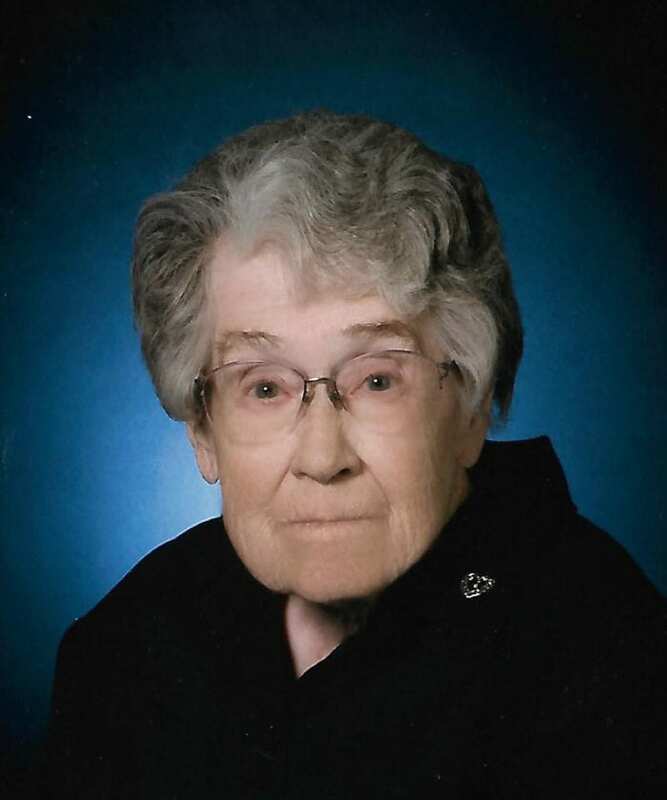 Mrs. Thompson was a faithful member of the First Presbyterian Church in State Center and served as a Sunday school teacher, a 50+ year member of the OES, 4-H and later as a leader, Neighborly Helpers group and Farm Bureau. Most of all, she treasured her family. She will be fondly remembered for helping with the farm, watching the Chicago Cubs, playing cards (500 especially), teaching typing, crocheting and bingo. Left to cherish her memory is her family: Charles (Cathy) Thompson, of rural Garwin, JoAnn (Jerry) Larsen, of Zearing, Jeanne Helgerson, of Elkader, and Ron (Karla) Thompson, of McKinney, TX; 12 grandchildren, 24 great-grandchildren, two great-great grandchildren, two nieces, two nephews and brother-in-law Rod “H.R.” Jones. In death, she rejoined her beloved Charles who died in 1986; her parents, a brother Thomas Wickersham; sister Mary June Jones and a grandson Scott Eggers.